Job is convinced that even in the midst of crushing loss and excruciating pain, He rests secure in God’s hands. Furthermore, he is certain of his own resurrection, no longer how long or how completely his body decays. The agony of this righteous man foreshadows the greater agony of the completely righteous Man who would bear Job’s sorrows and sins — along with those of all mankind. Job’s confidence is ours. Jesus suffered every one of our pains, knew all of our losses, bore all of our infirmities, and carried all of our sins. Christ’s loss is our restoration, His pain our pleasure, His death our forgiveness, and His resurrection our life everlasting. Text: “Oh that my words were written! Oh that they were inscribed in a book! Oh that with an iron pen and lead they were engraved in the rock forever! 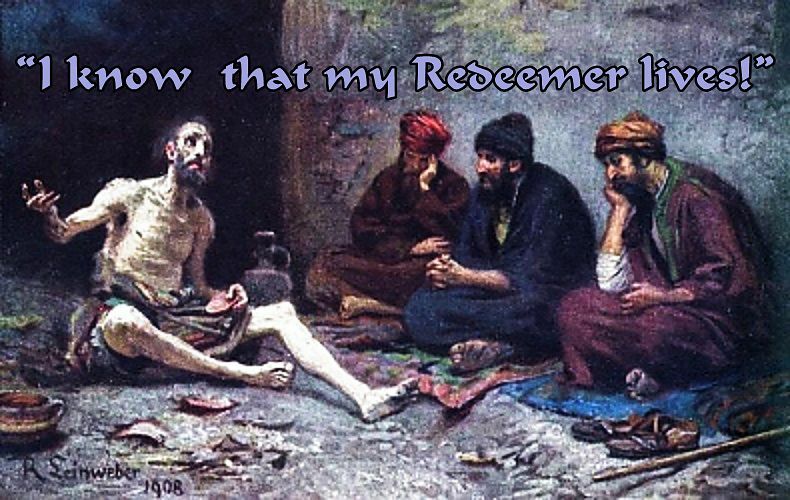 “For I know that my Redeemer lives, and at the last he will stand upon the earth. And after my skin has been thus destroyed, yet in my flesh I shall see God, whom I shall see for myself, and my eyes shall behold, and not another. Audio: Click to hear the MP3 of I Know.